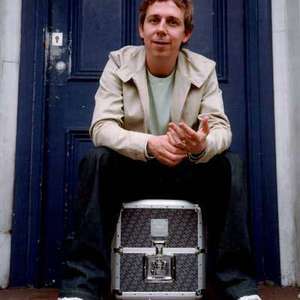 Gilles Peterson is an influential DJ and record-label owner from Switzerland, who moved to London (England), as a boy. Through his labels Acid Jazz and Talkin' Loud he has been associated with the careers of countless well-known artists of the 1990s. He is also well known as a radio DJ: starting out in pirate radio in the early eighties Gilles worked on a number of stations including Solar, and hosted jazz oriented weekend sessions at Camber Sands, and club nights at Soho's Whisky a GoGo. He is also well known as a radio DJ: starting out in pirate radio in the early eighties Gilles worked on a number of stations including Solar, and hosted jazz oriented weekend sessions at Camber Sands, and club nights at Soho's Whisky a GoGo. He found a slot on Radio London following Jazz DJ Brian Priestly and built up his name and career in London on Radio and by hosting the now legendary Talking Loud & Saying Something sessions at Camdens Dingwalls Club. He moved onto to have a radio show on London's Kiss FM dance music station, but was recruited to the BBC's youth-oriented Radio 1 in 1998. Peterson is known for his eclectic musical selections. Though not as "anything goes" as the late John Peel, he plays anything from dub and reggae through jazz, nu-jazz, soul, neo soul, R&B to drum and bass, house, broken beat, hip-hop and Jazz-funk. He has released numerous compilations of his favourite tracks over the years reflecting his wide ranging interests including the varied but soulful 'INCredible Sound of Gilles Peterson' and the African funking 'Gilles Peterson in Africa' going back to early Talking Loud compliations of Acid and Latin Jazz. He also has a home page on Radio 1 at http://www.bbc.co.uk/radio1/gillespeterson/index.shtml where you can listen to his latest radio show.